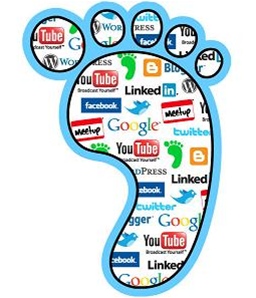 Knowing your digital footprint- what your internet use leaves behind- is very important. Just like in real life, every step we take online provides insight into our person. And don’t be fooled, even though you can’t see it, people are watching. That’s why it’s so important to protect that digital footprint, to somewhat wrap your reputation in virtual bubble-wrap. There are a few steps you can take to make sure that you are giving off the right impression of yourself. Be mindful about what you are posting on your social network channels. Too much information isn’t necessarily a good thing, especially because you don’t know who it’s reaching. Remember, what goes online stays online. Forever. Just because you decided that, once you posted it, you don’t want it live anymore…it’s still out there. It’s embedded in the social network DNA. Hitting delete doesn’t ever change that. So think first. Only allow those people who you know IN REAL LIFE to have access to your personal information. And even then, be wary because the more people know about you, especially in the written word, the more ammunition they have to use against you. The best practice for protection management is to keep private things private. Posting provocative or inappropriate pictures or posts online is only asking for trouble. On so many different levels. People you don’t know who are making inappropriate requests? Block them and move on. There are lots of trolls on the internet, it’s best not to feed them. There are many many more online. If you’d like to add one to our growing list, please put it in the comments. Melissa Brodsky has been involved in blogging and social media since 2006. Melissa is a full-time mom of five aspiring bloggers/digital media creators. She is a freelance writer social media strategist who has worked with small start up companies as well as some big names. Melissa has been featured on the Dr. Phil show, WDIV Channel 4, in the Detroit Free Press and various other publications and radio talk shows.